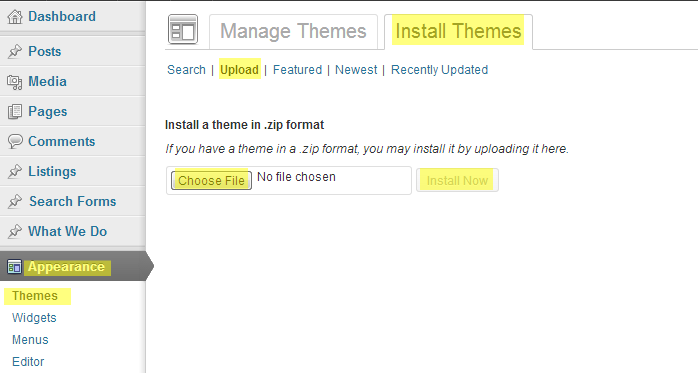 To start the theme installation first locate “listings.zip” within the package you already downloaded from Themeforest. Unpack that file to “Desktop” where you can find it easily. Follow the high-lighted portions to find easily all the steps described. 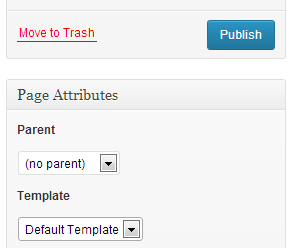 Next step is telling WordPress which page is Blog. Start Filling their custom fields, and chose their templates. 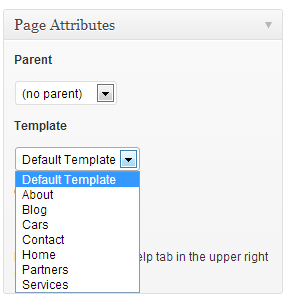 Each page-template has it’s own Custom Fields Group, and they will appear once you have choose the page template. The custom fields group will be explained just before this section for each page template. Home somehow is the most complicated page template and it has the major role on this template. It is made flexible and configurable individually if user needs to make 2 different Home-like templates and filter Listings on the logic user needs. Home is separated on 2 major sections : Slider and List-view Listings. 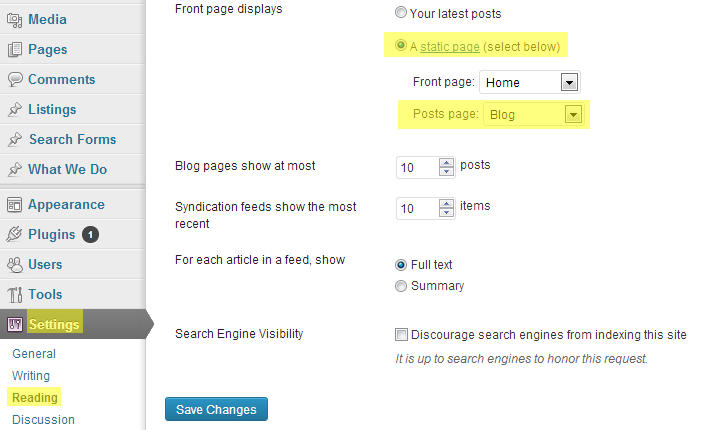 From this group user can chose the slider logic, on how to filter listings and display them. About page has the Portion of : Title, Subtitle, Team Members, Sidebar (Working Hours, What We Do). Subtitle : Is used to display the sub-title of the page as you can see on the picture below, and we used a second custom field separated from title as users might need a different Title of this page for menu. Members : This field is used to insert as many members as you need on this page.You can start inserting members by clicking “Add Row”.After you clicked that button you can see Custom Fields which each member can have on it’s own Member Presentation. Each field there is intuitive and well named like : Name, Position etc. except Social Networks. This page has only 1 field. Posts per page : Which defines how many Listings to show on this page. This page is somehow special and you should not put this page directly on the menu, because this is the page we need to display Search Results which we will explain later as we have a special widget for that. This page provides : Google Map, Ajax Contact Form, Contact Info Notes. To create the google map area first pick your Address from the map field visually and make sure the marker is displayed at the place you need.Next Chose google map zoom level which will indicate to zoom the map on the front view to the value you typed. We made a special cool marker for google map and you need to chose it’s text from “Map Marker Text“. This theme has it’s own Contact Form Builder where you can define each field name, type and placeholder. First of all please type the contact form note at “Contact Form Heading“. Next start making Contact Form fields by clicking “Add Row” at “Contact Form” field.There will appear a set of fields each time you click that button. You can control from there the Field Name,Field Placeholder, Field Type, Is required and if Fullwidth or Halfone. “Receiving Email” : this field is important as we use the e-mail typed on this field to direct messages received from contact form. “Success Message” – use this field to type the message which will appear to users once they sent any message using the contact form. This page contains partners or brands within. You can crate as many Partners as you need from this page. Click Add Row to add a new Partner and all Custom Fields for each one will appear. “Partner Logo” – Chose or Upload and Chose the partner logo which re-presents this partner visually. “Partner URL” – You can chose partner url from here, you might have a Custom Listing attribute which you can control using our option panel and assign listings to that attribute which acts as a category also and you can paste this partner Category as a URL and if user clicks it will display all Listings associated with this Partner. Similar to Partners this page has a Dynamic Field for Services. “Service Image” – Chose an image which can describe this service visually. Other fields are intuitive and text-only like “Title“,”Subtitle” and “Description” of a single service. This template is used to create the map where user can easily find listings on or near that location. First create a new page and chose “Map” template, than from the google map ui there choose where you need to center the map first and the zoom level. Next step is configuring the custom attribute, which will be designated for Location purposes. 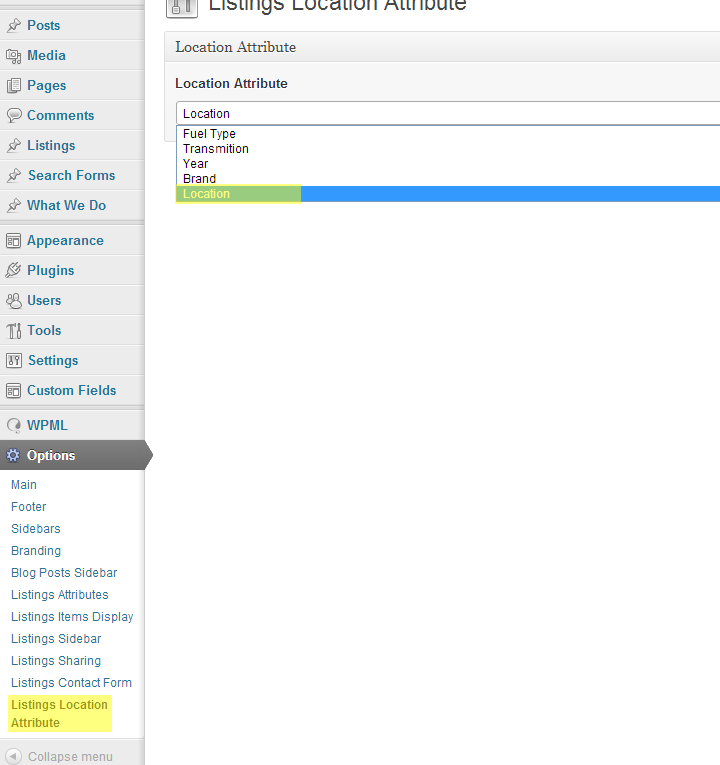 To start with that first make sure you have created a Custom Attribute which will be Location Related. Than go to Options – Listings Location Attribute and from the drop down there choose that Custom Attribute. A listing is the core functionality of this theme.It is a dynamic and a large scope of use. You can create a listing type of “Cars”,”Flats”,”Houses”,”Pets” etc, and this is because it support unlimited user defined custom attributes. A listing has Custom Attributes, Galleries with Images and Videos, Unlimited Brief Elements, Owner Informations, Price, Slider On Homepage configuration and Display Attributes where you can define which attributes will be shown only on home page and all other attributes will be shown on Listing Single Page. Here bellow will describe publishing and configuring a single “Listing” element. Rich Editor (WYSIWYG) : Is used to display the listing description. Gallery : Create as many gallery items as you need by clicking “Add Row” and chose from the drop-down bellow if this is a Video or Image item, if video than just paste the link from Youtube or Vimeo and if Image just chose the image from the WordPress Image Browser dialog. Elements : Click “Add Row” and type all the elements which will be displayed on the Listing single page. Owner Information’s : Type the Owner Email address, point the Owner Address from the Map if you want to display Owner details where user can contact the owner about that product. Price : Type the price of this Item. Display Attributes : From this checkbox group you can control which attributes will be shown on slider and home page, otherwise you can go to Umbrella – Listings Items Display and you can configure the global configuration which will be applied to each Listing Element if non of the Checkboxes is checked.You can also strict display attributes from options panel and only those on Option Panel chose will be displayed on home page. Each listing provides a set of custom attributes which is user defined and they are used for Search Purposes and Listing Describe.They are Listing extra categories. They are global which means the set of Custom Attributes you create will be shown on each Listing edit and create page and they are variable which means while publishing a Listing user can chose to Create a new Term, select existing Term or ignore that set. Eg: User can publish a car and assign Term : Petrol which is part of Fuel attribute, create Term : Automatic and assign it to Transmition attribute and ignore Color attribute at all by not assigning any of it’s Terms. Click “Add Attribute” and insert as many attributes you need there.Chose the Attribute name and the slug if you want to have a custom slug keyword which will appear on current Attribute Category page. Each Custom Attribute will appear on the right side as a Category Metabox Under “Listing Category”. Contact Form : To create a contact form for listings you need to go to Umbrella – Listings Contact Form and create there the form using the form builder there, the procedure is same as creating Contact Page which you can see on this section. 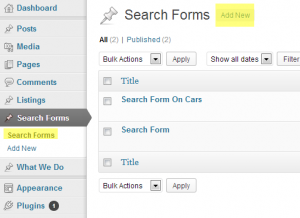 Search form is a widget which lets user to define some attributes and displays the results on how the user configured the drop-downs from there. It is a widget made custom for this theme. 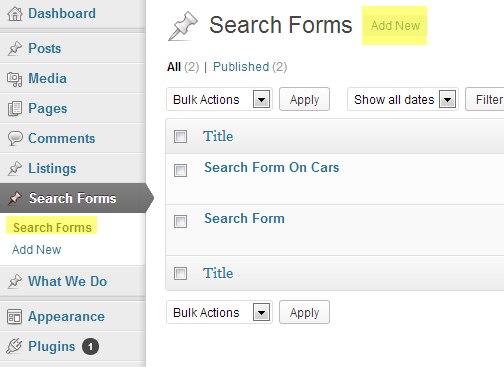 To start creating a Search Form go to “Search Form” – “Add new” . Type a title for this search form first. A dialog will appear and you need to define the Search Item for this row if it would be “Price” or “Custom Attribute”. If you click at “Custom Attribute”, you will add a new Drop Down to this form which will let user to select each terms which are on that Custom Attribute for filter purposes.Check this section to see how Custom Attributes Work. You can also define if this drop-down would be full width or half one. If you click “Price” than a new drop-down which allows user to search listings by price will appear.You need to define a field name for this row and you can define if this will be Full Width or Half Width. Than click “Add Row” to add Price Options there. You can add as many Price Options as you want by clicking add row within this row on Search Form Builder. You need to define the Price Value, Text which will appear on the Select option of this drop-down eg Up to 500 and you need to chose if this defines price Up to or Over To. If up-to is chose-ed as the option than it will filter all listings where the price is up to that value or if you select over-to it will search all listing where price is over the value you typed before. After you finished creating the Search Form than you need to go to Appearance – Widgets and Locate “Umbrella – Search Form” widget and drag it to the sidebar you want to display that. Than start filling the inputs from the widget form. 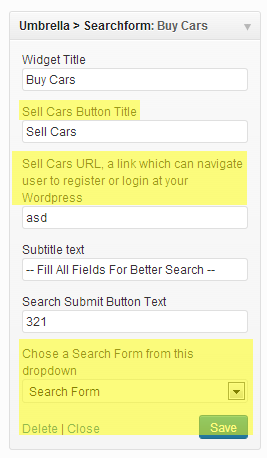 Sell cars button text : Is the text which will appear next to Search Form title on front-end if you have users which can add listings. Sell cars URL : is the URL where it will navigate users and it can be the WordPress Admin URL, WordPress Add Listing URL or any other one. Than from the drop-down you need to chose the Search-form which you created as which one will appear there.You can see the list of each search form you pre-defined to be there. We did this that way as this Theme support dynamic Sidebars and you can place the same Search Form on multiply places, like on Home Page, Cars Page ect. 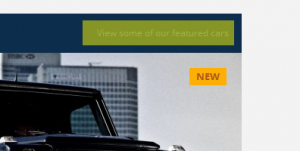 Important : In order to work the form you need to go to Umbrella – Main and locate Results Page field, from this field chose the Page where search results are displayed.This page should be a Car Page Template and you can see how they work from this section. This theme support dynamic sidebars. To start creating Sidebars go to Umbrella – Sidebars. Click Add Row to create a new Sidebar, and place there a name for this Sidebar. Click Add Row to create as many sidebars as you need and your good to go. Next step is defining each page the sidebar which will be assigned to them, and to do that go to any page you want and chose from the drop-down on the bottom the sidebar you created already. You can chose the sidebar alignment from there as well. To define Listings and Blog Posts sidebars you need to go to Umbrella – Blog Posts Sidebar and do the same thing as you did for pages and for Listings you need to go to Umbrella – Listings Sidebar to chose the sidebar for Listing Single Item page. Front-end publishing form enables user to publish Listings from front-end, and this can be easily by creating a new Page and assign it’s page the template “Publish Listing” from the Templates Drop-down. – Go to Tools / Importer. 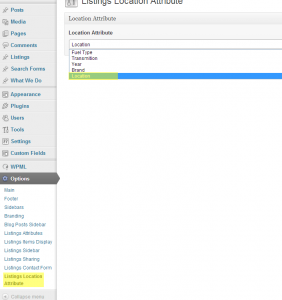 – Select WordPress from the list. 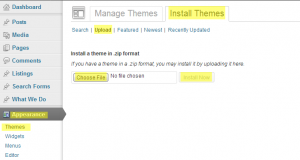 – Install adnd activate the WordPress importer plugin (if not installed). – Browse to the .xml file which comes with Listings pacakge listings.wordpress.2013-05-03 and press upload & import. – You also need to have access to your database (via phpmyadmin), and upload the .sql file database.sqlIn this way you will have all the demo content installed on your site.